Former Attorney General, Anil Nandlall on Saturday slammed President David Granger’s appointment of several Senior Counsel, saying the “opaque” and “discriminatory” process has led to the selection of a sitting judge in violation of practice. “These appointments were obviously done in a very opaque fashion. Some of the appointments reek of political bias and baseless favouritism. Persons deserving were spitefully and discriminatory omitted,” Nandlall said in reaction the appointments announced earlier Saturday for the first time since 1996. They are Attorneys-at-Law Neil Boston; Charles Fung-a-Fat, Llewely John, Rafiq Turhan Khan, Vidyanand Persaud, and Rosalie Althea Robertson. The other appointees are Justice Roxanne George-Wiltshire- a sitting High Court Judge- Retired Justice, Claudette Singh and Attorney General and Minister of Legal Affairs, Basil Williams. Expressing shock at President Granger’s “sudden announcement” of the appointment of Senior Counsel, Nandlall registered his strong objection the appointment of Justice George because she is a sitting Judge. “This runs contrary to every canon of practice and precedent which dictate that Senior Counsel must be practicing lawyers, for this reason the Chief Justice of Trinidad and Tobago, Ivor Archie, was forced to relinquish his appointment as Senior Counsel because he was a Judge and not a practicing lawyer when he was appointed. 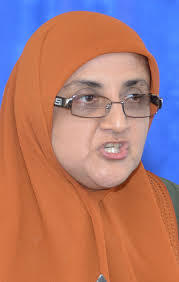 Kamala Persaud Bissessar was forced to do likewise because when she was appointed Senior Counsel, she was the Prime Minister of Trinidad and Tobago. Another person appointed has never done a case of substance at the Bar.,” said Nandlall. 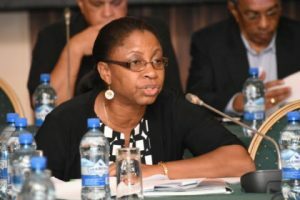 Nandlall charged that the “omissions are equally glaring” and questioned the basis for not appointing Director of Public Prosecutions, Shalimar Hack, Chancellor of the Judiciary Carl Singh and Chief Justice Yonette Cummings-Edwards. “As irregular as I believe it is for a Judge to be appointed, on what basis was one Judge appointed and the other Judges not, especially the Chancellor and Chief Justice?,” he said. Nandlall, an executive member of the opposition People’s Progressive Party (PPP), said this latest move represents a further deterioration of Guyana’s political environment since the APNU+AFC coalition came to office 20 months ago. “The slide into authoritarianism by this government is moving faster than I anticipated,” he said. The PPPC-led administration did not appoint Senior Counsel since 1996.